Last month, we published a report entitled ‘Definitive Champagne Data‘, in which we analysed data from over 1,000 ratings of the best champagnes from the industry’s most respected critics to find out which vintages and cuvées (from 1996, 1998, 2002 and 2004) rank the highest. We specifically presented Top 10 Champagne league tables – showing the critics’ average favourites. As we are looking at the very best champagnes from four of the most outstanding vintages in just over twenty years, showing merely the Top 10 is somewhat short-sighted, as many champagnes below this level are still mind-blowingly exceptional. Thus, we have extended the results to show the Top 25 Champagnes. The table below show the critics’ average favourites and Jancis Robinson MW’s favourites (as Jancis uses a 20-point scoring system, her results cannot be included in the averages). 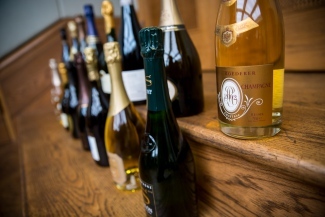 Looking beyond the Top 10, the critics’ averages show a score differential of just two points per hundred between the 10th and 25th ranked cuvées, demonstrating the prestige quality of all of these champagnes. Extending the league table has given champagnes from 2004 – with significantly less bottle development (being eight years younger than those from 1996) – the chance to show their current worth and future potential. Particular standouts include Dom Ruinart Blanc de Blancs 2004 (95.0/100) and Dom Pérignon Rosé 2004 (19.0/20). Also worth noting is the non-prestige cuvée entry in Jancis Robinson’s Top 25: Pol Roger Brut Vintage 1996. Whilst she awarded the prestige cuvée Pol Roger Sir Winston Churchill 1996 18.5+/20, she has awarded the ‘standard’ vintage release from the same year a higher 19.0/20. This is a perfect exhibition of the value of vintage champagne – an often understated concept we will be exploring further with Jancis later this year in our Prestige Cuvée vs Vintage Champagne tasting.